With the arrival of my daughter, I feel as though a white eyelet curtain has drawn closed in a circle around my little family and I am so happily swallowed up in the now we are living in. 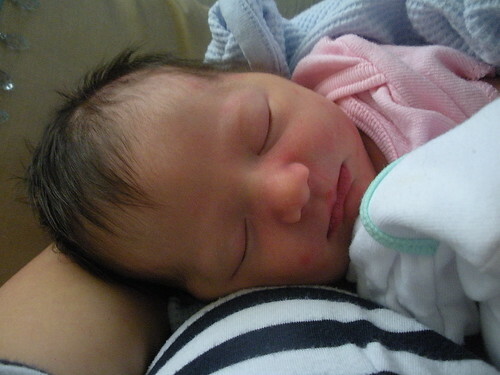 Small and mighty, miss Drew Alexandria joined our family on Tuesday, June 23rd weighing in at 5 pounds, 15 ounces. My labor was fast, and ended dramatically when she made a speedy entrance into the world, surprising all the nurses and causing my midwife to nearly miss the whole thing (this happened when Addison was born too). My mom's friend writes limericks for fun for such special occasions and I thought I'd share this one with you! Who thought that her birth was past due. And made all her peeps feel brand new! My bags are packed, the house is clean, the nursery is set up, an extra meal has been cooked and stored in the fridge, groceries have been purchased, the plants have been watered, and I'm showered and as rested as I can be. Time to have this baby. We will leave as a family of three tomorrow and return a family of four. I did my best to wrap things up at work over the next hour, cleaned out my desk, and drove home in kind of a daze. What just happened? "Ok, mom. Can I have a bite of your ice cream? Wanna try mine?" The rest of the week has been easy on my body and spirit, and my family and friends have been extremely supportive, bringing food, flowers, magazines, helping out with Addison, and doing some light cleaning. Its the transition time I didn't even know I needed, but it has given me a chance to fill up on "me" time before I give so much of myself over to this new little girl. It has been an emotional week too, with much time to stew over the coming changes and obsess over the things I hope will or won't happen, but mostly its been fun and relaxing. Last night Ben and I went on what is very likely the last date night to be had in some time. We enjoyed a relaxed and romantic dinner at a cute, authentic feeling italian restaurant called Lorenzo's. But the contractions subsided and we headed to see Away We Go. What a perfect movie for us to see. Not only was it hilarious, but is was a very sweet story about love, and finding what you need among what you already have. Go see it! Now its a new day, and I'm doing my best to appreciate each moment as it is. I don't know how to end this post, except to say, I hope you're enjoying the now, today, too! I think I might make it my personal mission to invent a machine that transports pregnant women who are on bedrest to an all-inclusive Mexican resort with king-size beds, huge pools, round-the-clock gourmet buffets and all-night room service. It just seems like the fair thing to do, no? I'd never heard this song by Colin Hay until today. It makes a beautiful soundtrack while on bedrest and waiting for the arrival of a baby girl. When I had Addison 3 1/2 years ago, I was 25. Not terribly young to be starting a family, but by far the first of any of my friends or family to have a baby. Addison was born in the dead of winter, days before Christmas, and to be honest, my entry into motherhood was a painfully traumatic transition in my life. Like many mothers, I was overwhelmed by my new responsibilities. The night wakings were difficult for me, and I literally did not sleep for more than 3 hours at a time for the first 7 months of Addison's life. I spent my maternity leave feeling isolated due to the wintry weather, my inability to drive (I won't get into it here, but I did not obtain my driver's license until I was 26), and, primarily, the reality that most of my friends were busy starting their careers, working 40 hour work-weeks, and staying out late at bars on the weekends. I spent most of my days on leave at home, alone, counting the hours until my husband would be home from work. I really tried to keep a positive attitude during this time, but the loneliness and responsibilities were frequently more than I could handle emotionally. I'm happy to say that this darker period in my life has passed. With one month to go until my baby girl arrives, I am excited to do things differently this time. Much has changed. I drive. I know the fun places to go with babies and small children in tow. Most importantly, we now have a large community of supportive friends who also have children. And, I'm excited to have a summer baby and enjoy much of my maternity leave enjoying the outdoors during the best months Oregon has to offer. I still have little anxious moments that it will be too hard. That I won't be able to handle all the change and newness and responsibility. But those moments are fleeting, and I do my best to let them pass me by. I truly want to enjoy every little moment of having this new baby girl. I'm really ready for all that life will bring me over the next few months. Ready and armed with a smile and open arms. My plants are going crazy!!! They must be loving the heat, because check them out this morning! I'm shocked! 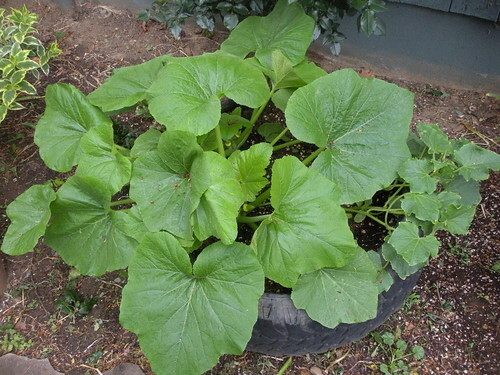 We even have some little thumb-sized squash hiding among the larger-than-life leaves. I think we may be harvesting soon! I'm also honored to share my son's very first drawing of "mommy" and that's daddy next to me (with the hair). This took me by such surprise! When we draw at home, it is all numbers and letters, all the time, and I had never seen him really attempt to draw people, so when I found these in the pile of art projects brought home from school, I literally had tears streaming down my face and gave Addison the biggest hugs. There's nothing quite like seeing your own portrait through the eyes of your first child. which, you've got to give him credit... is pretty accurate! I love you, my bubs.